On the release date of Andrew W.K.’s new album, and just over a week after he was named the American Association of Suicidology’s Person of the Year, author Phillip Crandall reflects on the significant messages AWK’s music holds for us all. 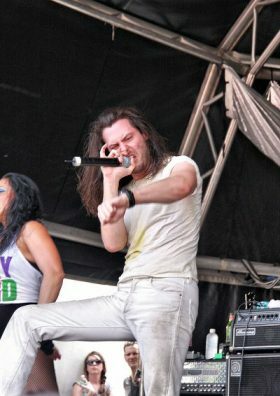 With any microphone he’s given, Andrew W.K. entertains, enlightens, encourages, empowers, and — as I attempted to explore in a book about his debut album four years ago — establishes a harmonious environment where that life-force feeling of “party” is complemented by the inclusive-wonders of the word “we” to create meanings and magic that I find as thrilling as the indescribable power of music itself. His new album is sure to continue that virtuous quest, one that the title You’re Not Alone all but confirms, and I can’t wait to crank those anthems when the double LP I pre-ordered is (hopefully!) gently placed on my Florida doorstep (hopefully!) today! In bestowing their award, the AAS is honoring Andrew W.K. for his “life-affirming music and work,” but a recognition this distinguished might lead an unfamiliar observer to believe the honor is for Works Completed rather than Work Undertaken Forevermore. The verb-implication cannot be overstated here. When it’s time to (verb), Andrew always (verbs) hard. I’m no AWK expert — Tony Shalhoub’s monologue about the Uncertainty Principle in The Man Who Wasn’t There disabused me of that goal, and my the-more-I-look-the-less-I-know musings on that film’s editor and the producer for Andrew’s Who Knows? DVD might only delight one of us — but if there’s an undeniable takeaway from my AWK experience, it’s the notion that striving to connect can be as joyous and ultimately glorious as the resulting bond. Perhaps that’s a compassionate, working-class cousin to the cliche that it’s the journey as much as the destination, but that doesn’t make the sentiment (or the work itself) any less poignant. The phrase “you’re not alone” first reads as a statement — admittedly a multifaceted one the further you stick your schnoz into Boris & Julie artwork and Steev & Kristine rabbitholes — but like “work,” the phrase implies action. Here, it can be a dignified pledge, one that wondrously acknowledges, learns, listens, shows solidarity, and proactively sparks those most-worthwhile of connection-seeking efforts. It also speaks volumes to me personally and any platform I wish to have. 33 1/3 may have handed me this here microphone based on a publishing merit, but I cannot separate that from privileges I was afforded at birth and by societal circumstance. And so long as there’s empathy in this world sensitive to the confusion, distress, and extraordinary challenges, a mic in privileged hands will always be most effective as an amplifier for those who are oppressed, marginalized, and have experienced injustice. To put those implied “you’re not alone” tenets to actual work — that is, to learn and to listen and to stand in complete solidarity with — is an endeavor that never ends but always enlightens, and I’m inspired by those who strive to raise the collective human spirit accordingly, from neighbors marching with messages of love and citizens kneeling with messages of social justice to young students persisting with messages of common sense. The Good Fights with the greatest goals always find their best results with those people who work in solidarity together. In Andrew W.K., the AAS and world-at-large has a true ally, and I choose that word carefully knowing it too has prescriptive flaws that could derail its massive potential. An ally is a noun best treated as a lifetime goal rather than a lifetime achievement, only as effective as the effort undertaken forevermore. When it’s time to (verb), allies always (verb) hard. The implications of its proactive, listening-and-learning inclusive spirit cannot be overstated here. Andrew W.K.’s I Get Wet by Phillip Crandall is available to order on Bloomsbury.com. Satire is just a kind of laughter, and is viewed as the cruelest sort of comedy.